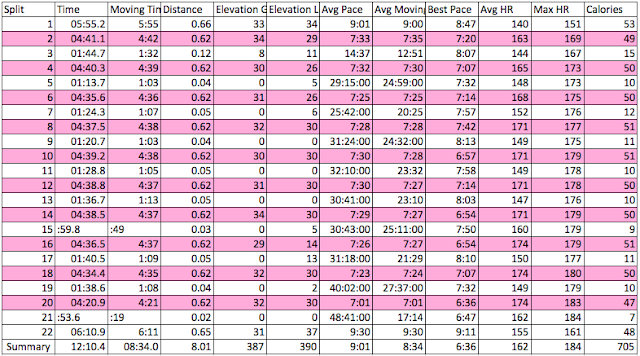 Well, my "A" spring marathon race is exactly in two weeks from now. This is my peak training week, or was, I have the last 3 training sessions out of 7 left, the last hard effort is today 10x 1 km repeats, two more workouts and I am off for taper time. The knee is getting way better even though I did some pretty hard efforts on it, so I am confident that with the taper, it will be just fine. I just have to continue with all the exercise my physiotherapist gave me. My greatest dad brought me two pairs of new shoes from the US, you can imagine I am just beyond excited! Not decided yet which ones I am racing in. 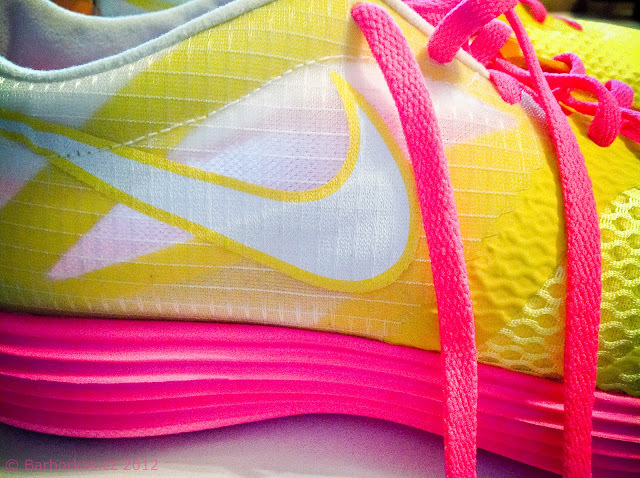 One are Nike's racing flats - the brand new Nike Lunar Mtrl+ (that stands for Nike Lunar Montreal). Second pair are Brooks Pure Connect, with only 4 mm heel to toe drop, but with enough support, I did several training runs in those and they are definitely very usable for training for me as well. The Nikes are more speed work or race only shoes. I started writing this post today morning and wanted to finish it before heading out for my run. I also wanted to configure a workout for the Garmin 910XT that I have for testing now. As you might have read in my previous post today, that didn't go quite as I expected. Thus I have spent two hours tweaking it around with no result. Fortunately, you can also create the workout inside the watch, so that is what I did. My well balanced breakfast already wore off, I sucked in a GU gel to have something to power my run with and went for my training. Before I tell you about how my workout went, back to marathon training and yesterday's day off. Very warm spring weather with more summer like temperatures came to the Czech Republic in the past few days. Since nobody can predict how the weather will be like on May 13 for the marathon, I am trying to do most of my runs in the late afternoon when it is really warm. You might wonder why. Well, it's simple, I have done many of my runs in cold or mild temperatures, but there haven't been many chances to train in really warm or hot conditions. It is harder on my body, but I know it will give me the power and confidence if it is really warm on the race day. As I said before, I am now finishing the toughest week of my training. I really could feel it Friday afternoon - I was hungry just few hours after eating my lunch. I had planned my 20 km run for after 8 pm to avoid the roller skaters, had two hours of free time when I came home. I ate bowl of cereal with milk but still felt hungry, so I went for an unhealthy candy treat. When else eat it than before a 20 km run when you burn it all. :) Fortunately, I still had one eye open to set up an alarm and fell asleep almost immediately after finishing the candy bar. And I slept really sound, I guess my body needed it. The run went well, I had my new running buddy to accompany me, so it was fun. Ate my dinner in the bath and went to bed just before midnight. I woke up when the sun came up, but fell asleep again and woke up at 10 am. Damn, my body really needed the rest! Saturday was a day off, until I got in operational mode it was 11 am. I decided that is great time for a little brunch of scrambled eggs and cheese on homemade bread. Bread with butter and honey for the dessert :) And of course cappuccino by Nespresso, yum! An addiction, yes I know (for both - bread with butter and honey and the cappuccino). It was beautiful day yesterday, totally blue sky without any clouds. I was invited to come visit Andrea with little Emma who are spending the long weekend (it's bank holiday here on Tuesday) at Andrea's parents country house less than one hour drive from Prague. Great opportunity to take my cute convertible for a ride :) I picked Katka up (since we are thee high school bffs) and we went for an afternoon in the country. We were having so much fun!!! Got home before midnight and went straight to bed. I almost forgot about the part where I went jealous about all the partying at the barbecue. I decided it was great occasion to catch up on the bloggosphere with a glass of stylishly pink prossecco that I won for the Best Czech Running Blog award :) Yum! Great end to a great day! My body seemed to replenish the deficit because I woke up just after 8 am. 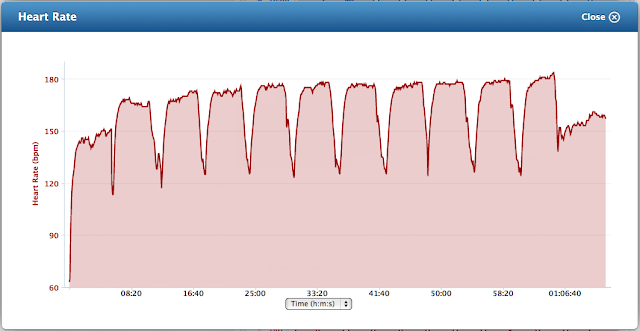 It seemed that I could get my training under my belt in a reasonable time, the Garmin decided otherwise. And you've already read about that in the firs few paragraphs. Today's training went really well, it was around 30 degrees Celsius (89 Fahrenheit) and I had 10x 1 km repeats at 4:45 min each (7:38 min/mile pace) planned. I didn't think it was that warm before I got out to the park, fortunately I had my Isostar and another water bottle for my doggie. Well, the repeats went just great. I have finished the last one faster than required and still felt like I could go for several more. This workout certainly gave me lot of confidence. Went to ice bath (well not exactly ice, but the coldest water that I can get from our pipes :) ), refueled with chocolate milk and after that with delicious roasted chicken, asparagus and potatoes my mom made. Tasted delicious, even more delicious since I only had to heat it up and eat. Really happy with the hear rate - I was expecting it to go higher in the heat. What was your weekend workout / race??? YAYYYYY, only TWO weeks to go! Bezva letni i kdyz dubnovy vikend, budu ti na PIM moc drzet palce! Doufám, že se letní počasí "vyplýtvá" teď, aby na PIMu bylo "běhatelno" :) Dík moc!!! Jinak teda skvelej trenink! Jsi husta! Ja si dala easy long run v Prokopaku.... ale byla to parada. Ja ty tvoje treninky fakt nechapu :-o :)) To bude neco, na maratonu! :) Drzim palce!